The Sagrada Família, Temple Expiatori of the Sagrada Família of its full name in Catalan, or Templo Expiatorio of the Sagrada Familia in Spanish is a basilica of Barcelona whose construction began in From 1882 onwards. This is one of the best known examples of Catalan modernism and an emblematic monument of the city. Unfinished by architect Antoni Gaudi, the Sagrada Família is located in the district of the same name (Eixample district). The architect has designed a meticulous symbology that makes this building a mystical poem. He has also shown great audacity of formal construction, such as the way of designing the chain-shaped arch structure1 or the combination of naturalistic sculptural treatments and the abstraction of towers. 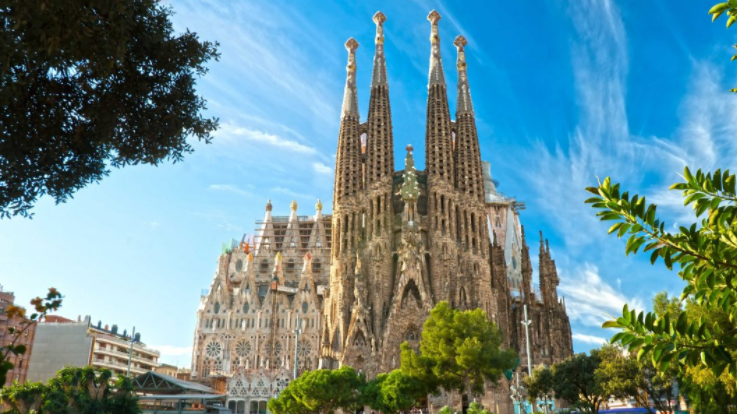 According to data from 2004, the Sagrada Família is the most visited monument in Spain, surpassing the Alhambra in Granada and the Prado Museum in Madrid.